Are there any health benefits that come from cleaning of air ducts? Heating, ventilation, and air conditioning (HVAC) systems have been shown to be a collection source for a variety of contaminants that have the potential to affect health, such as mold, fungi, bacteria, and particles of dust. The removal of such contaminants from the HVAC system and home should be considered as one component in an overall plan to improve indoor air quality. How should residential HVAC ductwork be cleaned? The most effective method of cleaning of air ducts is through “Source Removal.” This requires a contractor to place the system under negative pressure through the use of a specialized, powerful vacuum. While the vacuum draws air through the system, devices are inserted into the ducts to dislodge any debris that might be stuck to interior surfaces. The debris are pulled into the vacuum and removed from the system and the home. What are the antimicrobial chemicals and why would they need to be used? Antimicrobial chemicals are applied by some companies to the interior surface of the air ducts, to treat microbial contamination such as fungi (mold), viruses or bacteria. Before any antimicrobial chemicals are used, the system should be thoroughly cleaned. It is critical that any antimicrobial treatment used in your system be registered by the U.S. Environmental Protection Agency (EPA) specifically for use in HVAC systems. The use of antimicrobial chemicals is considered additional and not part of a typical cleaning of air ducts. Call (877) 800-2382 for cleaning of air ducts. What criteria should I use when selecting an air duct system cleaner? Verify that the company is certified by NADCA to perform proper cleaning of air ducts, is a member in good standing and properly insured. Make sure that the company is going to clean and visually inspect all of the air ducts and related system components. Ask if the company has the right equipment to effectively perform cleaning of air ducts, and if the company has done work in homes similar to yours. Get references from neighbors if possible. Avoid advertisements for “$99 whole house specials” and other sales gimmicks. What is the normal price range for cleaning of air ducts? The U.S. EPA says that “duct cleaning services typically – but not always – range in cost from $450 to $1000 per heating and cooling system, depending on the services offered, the size of the system to be cleaned, system accessibility, climactic region, and level of contamination.” Type of duct material is also taken into consideration. Consumers should beware of air duct cleaning companies that making sweeping claims about the health benefits of cleaning of air ducts – such claims are unsubstantiated. Consumers should also beware of “blow-and-go” air duct cleaning companies. These companies often charge a nominal fee and do a poor job of cleaning of air ducts. These companies may also persuade the consumer into unneeded services with and/or without their permission. What kind of equipment is best for cleaning of air ducts? Truck mounted vacuums or portable vacuums? NADCA does not endorse one kind of equipment over another. There are two main types of vacuum collection devices: (1) those mounted on trucks and trailers and (2) portable units. Truck/trailer mounted equipment is generally more powerful than portable equipment. However, portable equipment can often be brought directly into a facility, allowing the vacuum source to be located closer to the ductwork. Both types of equipment will clean to NADCA standards. All vacuum units should be attached to a collection device for safe containment prior to disposal. Any vacuum collection device which exhausts indoors must be HEPA filtered. How can we determine if the cleaning of air ducts was effective? The best way to determine if the air duct cleaning was effective is to perform a visual inspection of the system before and after cleaning. If any dust or debris can be seen, the system should not be considered cleaned. While you can perform your own visual inspection using a flash light and mirror, a professional cleaning contractor should be able to allow you better access to system components and perhaps the use of specialized inspection tools. In addition, following this post-cleaning check list can help to ensure a top quality job. The amount of time it takes to clean a residential HVAC system depends on many variables such as the size of the home, the number of systems, the extent of the contamination and the number of HVAC cleaners performing the job. Ask at least two contractors to inspect your system and give you a time estimate. This will give you a general idea of how long the job should take as well as an idea of how thoroughly the contractor plans to do the job. Why should I choose a NADCA member for cleaning of air ducts? NADCA Members have signed a Code of Ethics stating they will do everything possible to protect the consumer, and follow NADCA Standards for cleaning to the best of their ability. For a list of NADCA members near you, click here. Air duct cleaning companies must meet stringent requirements to become a NADCA Member. Among those requirements, all NADCA Members must have certified Air System Cleaning Specialists (ASCS) on staff, who have taken and passed the NADCA Certification Examination. Passing the exam demonstrates extensive knowledge in HVAC design and cleaning methodologies. ASCSs are also required to further their industry education by attending seminars in order to maintain their NADCA certification status. You may view the NADCA Code of Ethics here. Will cleaning of air ducts reduce our home energy bills? Air Duct Cleaning is a means of improving your home's indoor air quality. Air Duct cleaning refers to the cleaning of heating and cooling system components of forced air systems, including the supply and return air ducts and registers, grilles and diffusers, heat exchangers heating and cooling coils, condensate drain pans (drip pans), fan motor and fan housing, and the air handling unit housing. Failure to clean all components of the system can result in re-contamination of the entire system, thus minimizing the benefits of cleaning. There are two key components to HVAC cleaning: breaking contaminants loose, and collection of contaminants. Typically, a service provider will use specialized tools to dislodge dirt and other debris in ducts, then vacuum them out with a high-powered vacuum cleaner. Do I Have to Clean My Air Ducts? The short answer: yes. At some point in every homeowner’s life, it’s important to clean your air ducts, as they directly affect the air quality, circulation and even the energy usage in your home. 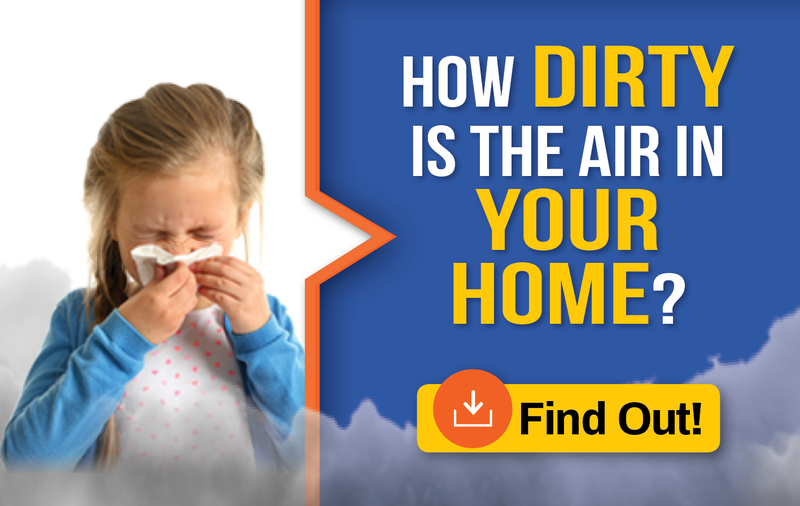 According to the NADCA, dirty air ducts can contribute to health issues like respiratory infections, autoimmune disorders or allergies because they can circulate contaminants and air pollutants throughout the home five to seven times per day. How can I prepare to have my air ducts cleaned? Make sure there is space cleared around the HVAC system and the duct registers inside your home. Once that is done, the best thing you can do is stay out of the way to ensure your safety and allow the technician to complete the cleaning.